The search for “the second beach to the right” gives a good chance to get to know the girls. Akari wonders if it was Peter Pan himself who sent the invitations. Aika hoped for a day of relaxation. Alice figures it may be a plot against them. The latter makes me wonder if she has a mind always unsure of the motives of those around her, or if she really does find herself being looked down upon by the older Undines of the Orange Company, jealous of her ability with an oar at her younger age. Wordbulding was very little this time around. The part that caught me off guard was when Akari said the line about not being able to go swimming in the ocean on Manhome. Does this reflect the state of the oceans of Manhome? Why would people not be allowed into them? Or is it allowed, but undesierable? Is Aqua man’s dream to terraform a new planet, or man’s last effort to survive in the future? 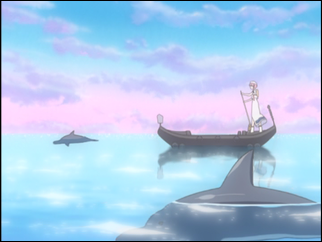 This surely goes far beyond the reach of Aria the Animation‘s story. Looking at the episode count for this series, I wonder how it’s decided what goes into an episode and what doesn’t. Why was there a decision to have the undeliverable letter in a prior episode, other than as a backdrop to how Mars became Aqua? Is there a purpose to the day in Neverland as part of the series as a whole, or is it simply meant to be a leisurely break from things? Can a series in 13 episodes afford to take a break? Or is this the true direction of Aria the Animation? Alicia has a line about everything being wonderful when seen through the eyes of a wonderful person. That sums up what this series is about. It isn’t just looking at the world of Aqua, the city of Neo-Venezia, and the lives of the training Undines. 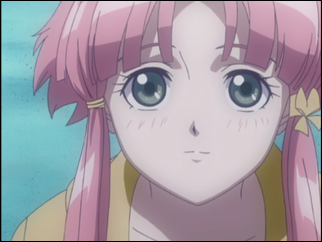 It’s about seeing everything reflected in the eyes of Akari. It’s about Akari’s words reaching a listless child unfulfilled when her expectations meet reality. It’s the way Akari splish-splashes through the water while everyone else is hurrying to find cover before the nearing rainfall. It’s seen in Akari’s smile, able to break through the wall Alice had built up that disrputed how she viewed those around her. It’s the ability Akari has to find a lost memory no one else will notice, to deliver a message by any means seen as unable to be delivered. 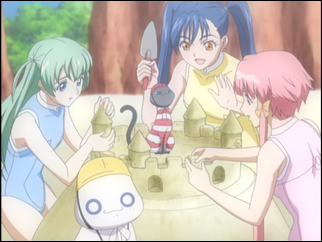 Without Akari, Aria the Animation could not be the same series. It was a day at the beach. They went for a swim. They ate watermelon. There was a grill at night. I mean, what else am I going to write about? I could definitely see that. The other Orange Company Undines are part of a bigger-style company. There’s no reason for them to fear that she’ll displace their jobs.